Postal workers are being offered £1,000 per week to steal bank cards, a BBC investigation has found. Online adverts offer huge sums to tempt Royal Mail staff to intercept letters containing cards and PINs. More than 11,000 people in the UK have been affected by this type of fraud in 2016, where bank cards are stolen in transit, according to UK Finance. Royal Mail would not disclose how many workers had been convicted but claimed "the theft of mail is very rare". It added its security team was investigating the findings by BBC Inside Out West Midlands and it had no evidence of its employees being involved. West Midlands Police said its economic and fraud teams are not aware of the BBC's findings and it has not had any reports of this type of fraud. A BBC journalist posed as a postman and responded to an advert offering £1,000 per week to intercept letters. After a few weeks working to build up the gang's trust, he was able to persuade a member to meet him. Our reporter secretly filmed a meeting outside the bus station in Lewisham, south-east London, where the gang member explained what was expected. "We're going to tell you, for example, that Ms *****, she's going to have a letter from NatWest," he told the undercover journalist. "Any letters from NatWest for Ms *****, intercept. As simple as that. "If you open up a new account you're going to get your card and you're going to get your PIN, right? Two letters, that's all it is. "We do that, you intercept the letters, bring them back to us, you get paid." Image caption The gang member said his contact in Birmingham works with "a number of postmen"
One gang in Birmingham has been operating for 30 years, according to the unidentified member who said the leader has "been in the game for 30 years". "He's worked with a number of postmen. "I've worked with two. One was in the Midlands - Coventry - and one was on the outskirts of London, Romford area. "But my guy, he lives in Birmingham and I obviously do the work, he sorts out the other side." 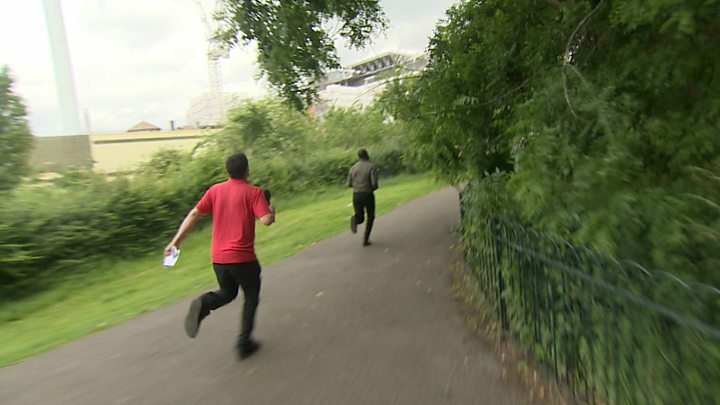 On their second meeting in a south London park, the undercover journalist confronted his contact. The gang member offered no answer and ran away when asked why he was trying to recruit postal workers to commit fraud. Royal Mail would not comment on how many of its workers had been prosecuted for stealing mail since it was privatised in 2013. However, 1,759 Royal Mail workers were convicted of theft between 2007 and 2011. Figures from UK Finance show the problem does not seem to be getting any better with the number of cases, and the cost to card issuers, rising each year since 2014. In 2016, there were 11,377 cases of fraud where a card is stolen in transit, costing card issuers £12.5m. UK Finance said it works closely with Royal Mail to target these types of gangs. It has its own police unit with prosecution powers. "We do have our own police unit and they target organised criminality," Katy Worobec, head of fraud detection at UK Finance said. "They try and get the people who are actually organising the criminality behind the scene. "Once you've taken that part of the gang out, the thing falls apart. "We've got a very good relationship with Royal Mail to help target these types of gangs and we've seen some good successes in the past." Royal Mail said: "We take all instances of fraud - alleged or actual - very seriously. "Our security team is reviewing the programme's findings as a matter of urgency and will continue our close and ongoing cooperation with the relevant law enforcement agency. "The overwhelming majority of postmen and women do all they can to protect the mail and deliver it safely. The safety and security of mail is of the utmost importance to Royal Mail. "We deliver millions of items safely every day and the theft of mail is rare. The business operates a zero tolerance approach to any dishonesty. We prosecute anyone we believe has committed a crime." Darren Blythe, from Banbury, had his bank card intercepted by postal worker Damon Alvey in 2013. He sensed something was wrong when the new bank card he requested did not arrive within the estimated time. "I was waiting and waiting and eventually I rang the bank and that's when they told me my bank account had been wiped out totally." Alvey, from Thame, was jailed for 10 months in 2014 for the fraud which saw about £3,000 taken from Mr Blythe's account. "He left me with just over £2 in my account," Mr Blythe said. "It made me really depressed. I was stuck indoors for days and days on end." Although his money was refunded by the bank within two weeks, Mr Blythe said he did not "trust postmen any more really". You can see this story in full on BBC Inside Out West Midlands at 19:30 BST on BBC One on Monday 4 September, or via iPlayer for seven days afterwards.